Aeolian processes are those that involve the movement of air (i.e. wind) to shape landscape features, such as the erosion, transport and deposition of sediments. The word ‘Aeolian’ is derived from ‘Aeolus’, the Greek god of the winds. Aeolian sand dunes are mounds or ridges of loose sand deposited by wind power, and they can range from 1 metre to several kilometres long. Dunes can occur as isolated ridges or they may be grouped together to form dune fields. There are three basic requirements for the formation of dune fields: 1) a large supply of sand, 2) wind energy to transport and rework the sand and 3) climatic conditions which allow a large amount of sand to accumulate and be maintained over a long period of time. Generally, aeolian processes have considerable influence in arid areas with low vegetation cover and low soil moisture content. However, dunes can form in any climatic regime so long as there is bare sand and strong winds. Several sand dunes can be found in the southern part of the prairie provinces. The supply of sand to most dune fields in the Canadian prairies are remnants from deglaciation. This is an important characteristic of Canada’s continental dune systems, since it means they are closed systems with finite sediment supplies. The main factors influencing prairie dune activity are variations in climatic factors (affecting sediment availability) and/or wind power (affecting sediment transport). The majority of dune development on the Canadian prairies likely began after deglaciation when limited vegetation had developed, and there was an abundance of sandy sediments and strong winds. A study by Hugenholtz and Wolfe (2005) found that historic dune activity on the southern Canadian prairies has been decreasing since the early to mid 1900s due to climate variations such as reduction in wind speed. The largest active sand dune system in Alberta are the Athabasca Dunes, which are part of the province’s largest Ecological Reserve, the Athabasca Dunes Ecological Reserve in the Richardson backcountry. The active dunes are a series of sand ridges up to 12 metres tall, in an area stretching about 8 kilometres from north to south and 1.5 kilometres from east to west. They are surrounded by a variety of peatlands, forests and lakes. The dunes are migrating southeast at a rate of about 1.5 metres each year, burying the surrounding jack pine forests and filling in small lakes. Despite this, the reserve still provides habitat to a variety of plant and animal species, such as the Arctic tern which is not known to nest anywhere else in the province. Vegetated aeolian dune fields are referred to as “stable” and unvegetated fields as “unstable” or “active”. Vegetation around sand dunes suppresses aeolian sediment transport, and at a critical vegetation cover threshold, dunes become completely immobilized. There are two geomorphic functions of vegetation. It acts as a protective skin which shelters the surface from erosion. The presence of vegetation prevents significant change in topography and dune formation. Disturbance suppression. When the protective skin is punctured by disturbance, the underlying sediment is exposed. Colonizer species, which can withstand extremely high rates of sediment deposition and nutrient poor soil, then grow in, and halt the transport of sediments. Dune blow-out on the Cottonwood Trail at Sleeping Bear Dunes National Lakeshore. 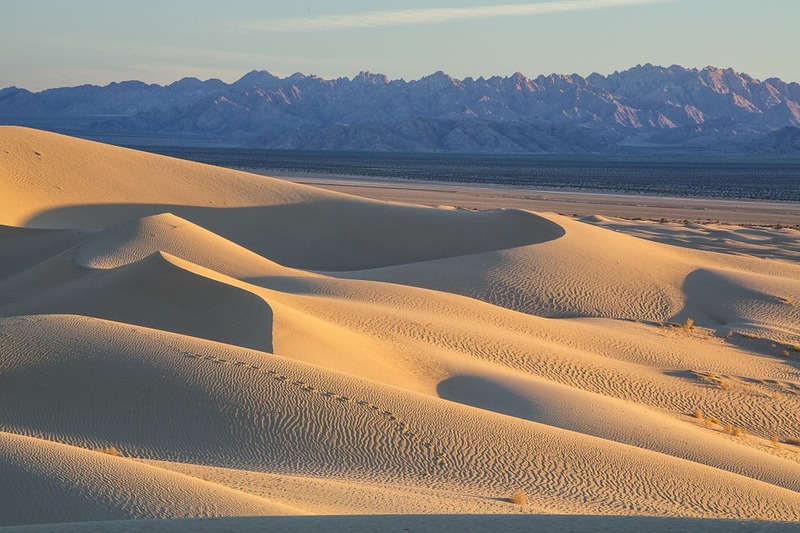 Photo by National Public Service of U.S.
Stabilization is the process in which dunes transform from active to stable states. Reactivation is the reverse process. Stable dunes may reactivate through the development and expansion of blowouts, which are landforms resulting from the reduction in vegetation cover around sand dunes. Blowouts commonly form following two processes. Direct disturbance destroys vegetation and exposes the underlying sediment surface. This leads to the second process where the dune advances and kills vegetation by eroding and depositing sediment faster than vegetation can re-colonize. Generally, reactivation is considered as a form of land degradation because it can create environmental, social and/or political problems. Stable dunes are desirable because they can be inhabited and may provide resources such as water, timber and grazing, whereas active dunes are unfavorable to human and non-human use. Pye, K., & Tsoar, H. (2009). Aeolian Sand and Sand Dunes. Leipzig, Germany: Springer. Hugenholtz, C.H., & Wolfe, S.A. (2005). Recent stabilization of active sand dunes on the Canadian prairies and relation to recent climate variations. Geomorphology, 68, 131-147. Barchyn, T.E., & Hugenholtz, C.H. (2013). Reactivation of supply-limited dune fields from blowouts: A conceptual framework for state characterization. Geomorphology, 201, 172-182.